School’s out for the summer! Woohoo! The kids are home. Vacations are scheduled, and the sunshine and swimming pools are calling your family’s name. Summers are great! They’re great for many reasons. One great thing to consider adding to your summer schedule is wisdom teeth removal. 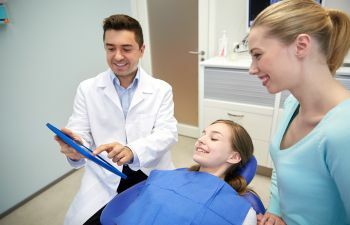 Here are 5 reasons why summer is a great time to schedule your teen’s wisdom teeth removal. Your teen won’t need a school excuse note. Let’s face it; those pieces of paper are such a pain. Your teen won’t need anyone’s permission to be home in her own bed recovering from her surgery. Your teen will be able to recover with you by his side. Teens really feel the pressure of missing school and can attempt to prematurely get back to school. Summer is a great time for your son to rest, recover and get all your love and care during the entire recovery process. Eating is a challenge after wisdom teeth removal. It’s difficult to pack soft foods for your child to eat after surgery. Preparing an appropriate post-surgery meal and snack is much easier from the comfort of your own home. No teen wants to go to school with puffy cheeks. Swelling and swollen cheeks are a normal part of recovery from wisdom teeth removal. Teens are naturally more self-conscious about their looks, so puffy cheeks don’t go over well when walking in the halls of their school. Gwinnett Family Dental Care practice includes a Board Certified Oral Surgeon who can offer you wisdom teeth removal right in our office for your convenience and comfort. Book your teen’s wisdom teeth removal this summer.